Actinomycin intercalates between the bases in a DNA helix. Cells are master chemists, and many times the search for medical compounds begins by looking to nature. Many antibiotics have been found by studying the constant warfare between bacteria and fungi, and isolating the toxic molecules that they build to protect themselves. Actinomycin is the first natural antibiotic discovered that has anti-cancer activity. It was discovered in the bacterium Streptomyces antibioticus in 1940. Unfortunately, it is too toxic for general use, killing cancer cells but also poisoning the patient, but related molecules have subsequently been discovered, and are now widely used for cancer chemotherapy. Early studies of actinomycin revealed that it intercalates into the DNA double helix. Actinomycin is composed of two parts: a flat ring (shown here in green) that resembles the DNA bases, and two cyclic peptides composed of unusual amino acids (shown here in blue). 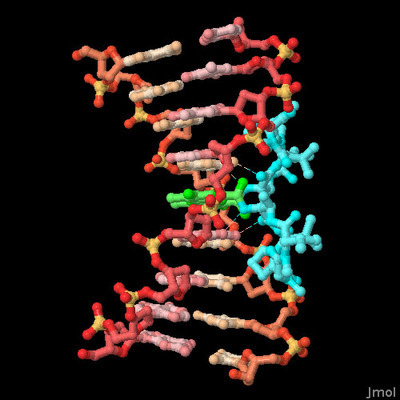 The flat ring intercalates between bases in the DNA double helix, and the cyclic peptides fit perfectly into the major groove of the DNA (PDB entry 173d ). The result is a stable, but lethal, complex with the cell's genome. Intercalating drugs are used for cancer chemotherapy because they poison cells that are rapidly dividing, like the cells in a growing tumor. Study of these drugs has revealed that topoisomerases are the major site of action. 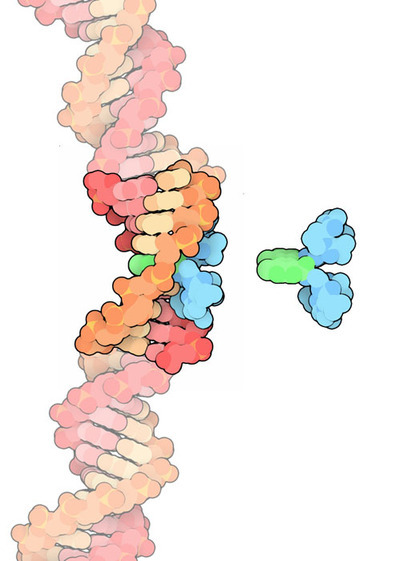 Topoisomerases begin by breaking DNA, then they make a topological change such as relaxing supercoils or untangling strands, and finally they reconnect the DNA in its proper form. Intercalating drugs block the reconnection step, freezing the topoisomerase after it has broken the DNA. This is a disaster when the cell divides: when a replication fork reaches the site, a lethal double-strand break is formed as the replication machinery passes through the damaged DNA. 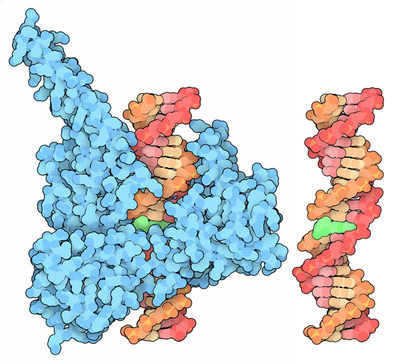 Actinomycin (green) inhibiting a DNA topoisomerase (blue). Many different intercalating molecules have been discovered, either in living organisms or designed by scientists. Based on their different sizes and shapes, they target different topoisomerases. Actinomycin blocks type II topoisomerases, which are involved with detangling DNA. The molecule shown here in green, topotecan, blocks type I topoisomerases, which are involved in relaxing superhelical stress (PDB entry 1k4t ). The structure captures the drug bound to DNA with one strand clipped, all bound inside the topoisomerase. Many intercalating molecules have no preference for a particular sequence of DNA, but actinomycin binds most strongly to GC steps. The structure of actinomycin with a short piece of DNA (PDB entry 173d ) revealed the reason for this: the cyclic peptide portion of the molecule forms specific hydrogen bonds with the edges of the guanine bases. To take a closer look at this interaction, click on the image for an interactive Jmol. Structures for many other DNA intercalating drugs are available in the PDB. You can start by searching for "anthracycline", the name of a large class of anticancer drugs. Y. Pommier, E. Leo, H. Zhang & C. Marchand (2010) DNA topoisomerases and their poisoning by anticancer and antibacterial drugs. Chemistry and Biology 17, 421- 433. U. Hollstein (1974) Actinomycin, chemistry and mechanism of action. Chemical Reviews 74, 625-652.